I'd like to welcome everyone aboard. We are currently cruising on the world wide web at speeds reserved for fun. We are expecting to reach our destination approximately three clicks ahead of schedule. Meanwhile check out our games that we created especially for you. Hope you like them as much as we do. Thank your for flying with us! Sit back, relax and enjoy the rest of the flight. 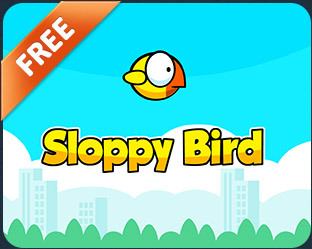 Sloppy Bird is an endless flappy adventure of our clumsy bird Lemon. He needs your help to fly avoiding the obstacles. Sloppy Bird is a tribute to the short-lived internet sensation Flappy Bird. Join the craze and see for yourself what the fuss is all about! Enjoy your single touch flappy ride!